Thursday, September 9, 2010, Mark Olson, Soundcheck. My first night at MFNW 2010 began at Mississississississ(!! )ippi Studios in Portland, Oregon. 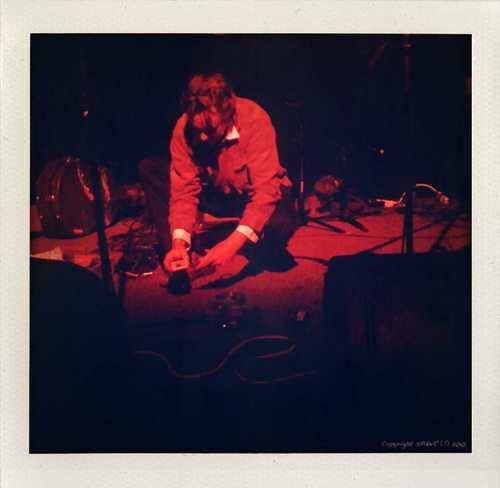 Mark Olson, one of the founding members of The Jayhawks, took stage with a flight of soulful folk tunes, some of which were off his relatively new (July, 2010) offering Many Colored Kite. Though he was dressed like my dad after a long day at the office, Olson’s rustic delivery made me feel like we should have been sitting on a porch in the bayou eating homemade pie and drinking whiskey with unicorns and puppies playing with hand grenades in the background. Feelings, like art, aren’t always congruous. I realize that the Mark Olson and Gary Louris pairing is a whole different ballgame compared to Mark Olson alone, but I can’t resist offering the link to their Daytrotter session. They truly are harmonic soul mates. This entry was posted on August 4, 2010, 15:09 and is filed under MusicFest NW 2010. You can follow any responses to this entry through RSS 2.0. You can leave a response, or trackback from your own site.